Every compliment I've received on a perfume lately has been because of Champagne de Bois from Sonoma Scent Studio. Of course, it might also have something to do with wearing this fragrance very often (well, often for me), which is also an indication for a serious love and a really really good perfume. A few years ago, when Champagne de Bois first appeared on the scene, I remember conversations with other fragonerds who compared it to Chanel Bois des Iles. This comparison actually was the reason I wasn't in a hurry to get acquainted with Laurie Erickson's creation-- after all, I already had a bottle of Bois des Iles parfum. Silly me. While Champagne de Bois and the Chanel classic share the idea of aldehydes that lift a heavier spicy woody base and make it sparkle, as well as the use of a beautiful sandalwood note. But while Bois des Iles is also cozy and foody with its gingerbread note, Champagne de Bois is decidedly ambery and somehow maintains an outdoorsy, living wood feel. Now, I'm an urban person and nature tends to freak me out, but I love the bottled feel of it in perfume; this is exactly what I get from this Sonoma Scent Studio fragrance: a hint of en enchanted forest, sparkling gems in an ancient treasure box and the creamy sweetness of a beautiful amber that stays on the skin forever and ever (12 hours easily, the sillage is noticeable for 6-8 hours). Notes: aldehydes, jasmine, clove, sandalwood , labdanum absolute, vetiver, amber. See more reviews by Abigail and Birgit, as well as Victoria's guide to champagne-like perfumes. I just took a look at the Sonoma Scent Studio site and noticed that Champagne de Bois is temporarily out of stock. I hope it's back soon, so everyone can order samples. The 5 ml purse spray that I've been quickly depleting is priced somewhere round $16, if I remember correctly. 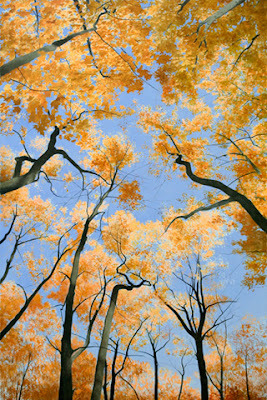 Art: Maples by Alexander Volkov. Oh god I love Champagne De Bois. It's been out of stock for a while and I really want it to come back since I used up my sample. To me, it smells fizzy, and I always think of champagne toasts at Christmas when I wear it, but you're right that it's got some outdoorsy-ness to it. Lovely review Gaia-CdB was my first purchase from SSS and is one of my favorites. Laurie is a very talented perfumer, I wish more people knew about how lovely her line is. A co-worker wears Winter Woods and it's amazing on her. Hmmm, I have a sample of this and will have to give it another try. Although I love sandalwood, my tastes don't incline to "woody" fragrances, particularly those with cedar. I gave this one an initial dab and quicky relegated it to a small baggie, along with Winter Woods, so they wouldn't pollute anything else. They are very potent! But my perfume tastes are continually developing, I love aldehydes, and I will give it another chance. Champagne de Bois was the first SSS fragrance I tried and it was love at first sniff! It was my favorite of the line and remained so until a couple of weeks ago when I won a travel spray of Nostalgie (in fact I'm wearing it today). Lucky me! I really love Laurie's style - she is one of my favorite parfumeurs.